A vulture is a scavenging bird of prey. The two types of vultures are the New World vultures, including the Californian and Andean condors, and the Old World vultures, including the birds that are seen scavenging on carcasses of dead animals on African plains. Some traditional Old World vultures (including the bearded vulture) are not closely related to the others, which is why the vultures are to be subdivided into three taxa rather than two. New World vultures are found in North and South America; Old World vultures are found in Europe, Africa, and Asia, meaning that between the two groups, vultures are found on every continent except Australia and Antarctica (though Trigonoceps vultures have crossed the Wallacea line). A particular characteristic of many vultures is a bald head, devoid of normal feathers. Although it has been historically believed to help keep the head clean when feeding, the bare skin may play an important role in thermoregulation. Vultures have been observed to hunch their bodies and tuck in their heads in the cold, and open their wings and stretch their necks in the heat. Vultures also use urine as a way to keep themselves cool by urinating on themselves. A group of vultures is called a kettle, committee or wake. The term kettle refers to vultures in flight, while committee refers to vultures resting on the ground or in trees. Wake is reserved for a group of vultures that are feeding. The word Geier (taken from the German language) does not have a precise meaning in ornithology; it is occasionally used to refer to a vulture in English, as in some poetry. Vultures are scavengers, meaning they eat dead animals. They rarely attack healthy animals, but may kill the wounded or sick. When a carcass has too thick a hide for its beak to open, it waits for a larger scavenger to eat first. Vast numbers have been seen upon battlefields. They gorge themselves when prey is abundant, until their crops bulge, and sit, sleepy or half torpid, to digest their food. These birds do not carry food to their young in their talons but disgorge it from their crops. The mountain-dwelling bearded vulture is the only vertebrate to specialize in eating bones, and does carry bones to the nest for the young, and it hunts some live prey. Vultures are of great value as scavengers, especially in hot regions. Vulture stomach acid is exceptionally corrosive (pH=1.0), allowing them to safely digest putrid carcasses infected with botulinum toxin, hog cholera bacteria, and anthrax bacteria that would be lethal to other scavengers and remove these bacteria from the environment. New World vultures often vomit when threatened or approached. Contrary to some accounts, they do not "projectile vomit" on their attacker as a deliberate defense, but it does lighten their stomach load to make take-off easier, and the vomited meal residue may distract a predator, allowing the bird to escape. Vultures in south Asia, mainly in India and Nepal, have declined dramatically since the early 1990s. It has been found that this decline was caused by residues of the veterinary drug Diclofenac in animal carcasses. The government of India has taken very late cognizance of this fact and has banned the drug for animals. However, it may take decades for vultures to come back to their earlier population level, if they ever do: without vultures to pick corpses clean, rabies-carrying dogs have multiplied, feeding on the carrion, and age-old practices like the sky burials of the Parsees are coming to an end, permanently reducing the supply of corpses. The same problem is also seen in Nepal where government has taken some late steps to conserve remaining vultures. Similarly, in Central Africa there has also been efforts to conserve the remaining vultures and bring their population numbers back up. This is largely due to the bushmeat trade, "it is estimated > 1 billion kg of wild animal meat is traded" and vultures take up a large percentage of this bushmeat due to their demand in the fetish market. The substantial drop in vulture populations in the continent of Africa is also said to be the result of both intentional and unintentional poisoning, with one study finding it to be the cause of 61% of the vulture deaths recorded. The vulture population is threatened across Africa and Eurasia. There are many anthropogenic activities that threaten vultures such as poisoning and wind energy collision mortality. ^ "Fossilworks:Aegypiinae". Fossilworks. Retrieved September 4, 2018. ^ Hanneke J.M. ; et al. "Continental-style avian extinctions on an oceanic island" (PDF). Repository.si.edu. Retrieved 17 October 2018. ^ Ward, J.; McCafferty, D.J. ; Houston, D.C.; Ruxton, G.D. (April 2008). "Why do vultures have bald heads? The role of postural adjustment and bare skin areas in thermoregulation". Journal of Thermal Biology. 33 (3): 168–173. doi:10.1016/j.jtherbio.2008.01.002. ^ Arad, Zeev; Bernstein, Marvin H. (2 March 1988). "Temperature Regulation in Turkey Vultures". The Condor. 90 (4): 913–919. doi:10.2307/1368848. JSTOR 1368848. ^ a b c Galván, Javier (2014). They Do What? A Cultural Encyclopedia of Extraordinary and Exotic Customs from around the World. Santa Barbara, California: ABC-CLIO. p. 289. ISBN 1-61069-342-6. ^ "Fast Vulture Facts". WebVulture.com. Archived from the original on July 18, 2011. Retrieved February 15, 2013. ^ a b Buechley, Evan R.; Sekercioglu, Cagan H. "Vultures". Current Biology. 26 (13): R560–R561. doi:10.1016/j.cub.2016.01.052. ^ Caryl, Jim (September 7, 2000). "Re: How come that vultures can resist dangerous toxins when feeding on carcass". MadSci Network. Retrieved February 15, 2013. ^ "Turkey Vulture Facts". Turkey Vulture Society. Retrieved 2012-12-01. ^ Conger, Cristen. "Why is it a bad idea to scare a vulture?". HowStuffWorks. Retrieved February 15, 2013. ^ Oaks, J. Lindsay; Gilbert, Martin; Virani, Munir Z.; Watson, Richard T.; Meteyer, Carol U.; Rideout, Bruce A.; Shivaprasad, H. L.; Ahmed, Shakeel; Chaudhry, Muhammad Jamshed Iqbal; Arshad, Muhammad; Mahmood, Shahid; Ali, Ahmad; Khan, Aleem Ahmed (February 12, 2004). "Diclofenac residues as the cause of vulture population decline in Pakistan". Nature. 427 (6975): 630–633. doi:10.1038/nature02317. PMID 14745453. ^ Prakash, Vibhu; Bishwakarma, Mohan Chandra; Chaudhary, Anand; Cuthbert, Richard; Dave, Ruchi; Kulkarni, Mandar; Kumar, Sashi; Paudel, Khadananda; Ranade, Sachin; Shringarpure, Rohan; Green, Rhys E. (November 7, 2012). 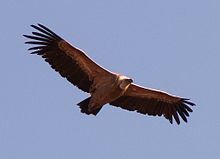 "The Population Decline of Gyps Vultures in India and Nepal Has Slowed since Veterinary Use of Diclofenac was Banned". PLOS One. 7 (11): e49118. doi:10.1371/journal.pone.0049118. Retrieved February 15, 2013. ^ van Dooren, Thom (May 2011). "Vultures and their People in India: Equity and Entanglement in a Time of Extinctions". Australian Humanities Review (50). ^ Buij, R.; Nikolaus, G.; Ogada, D.; Whytock, R.; Ingram, D.J. (August 2015). "Trade of threatened vultures and other raptors for fetish and bushmeat in West and Central Africa". Fauna & Flora International. EBSCOhost. 50 (4): 606–616. doi:10.1017/S0030605315000514. ^ Ogada, Darcy; Shaw, Phil; Beyers, Rene L.; Buij, Ralph; Murn, Campbell; Thiollay, Jean Marc; Beale, Colin M.; Holdo, Ricardo M.; Pomeroy, Derek (2016-03-01). "Another Continental Vulture Crisis: Africa's Vultures Collapsing toward Extinction". Conservation Letters. 9 (2): 89–97. doi:10.1111/conl.12182. ISSN 1755-263X. ^ Santangeli, A., Girardello, M., Buechley, E., Botha, A., Minin, E. D., & Moilanen, A. (2019). Priority areas for conservation of Old World vultures. Conservation Biology. ^ Buechley, Evan R.; Şekercioğlu, Çağan H. (2016-06-01). "The avian scavenger crisis: Looming extinctions, trophic cascades, and loss of critical ecosystem functions]". Biological Conservation. 198: 220–228. doi:10.1016/j.biocon.2016.04.001. Hilty, Steven L. (2003). Birds of Venezuela. London: Christopher Helm Publishers. ISBN 978-0-7136-6418-8. OCLC 51031554. Wikimedia Commons has media related to Vultures.